The previous tutorial shows you how to make the Photoshop splash graphic, this Illustrator tutorial will show you how to make the Illustrator CS2 splash graphic using the same technique: gradient and multiply blending mode. First create the paths of the flower with the Pen Tool. Select one of the petals, fill it with Radial Gradient (pick similar colors as shown) and select Multiply in Transparency pallate. 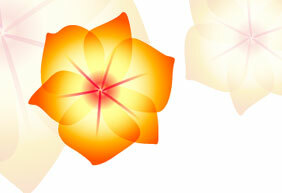 Select the un-filled petals, use the Eyedropper Tool, click on the gradient petal to copy the fill. You might need to adjust the gradient fill of each petal with the Gradient Tool. Create a filament, fill it with Linear Gradient and select Multiply in Transparency pallete. Use the Ellipse Tool, make a circle, fill it with Radial Gradient (as shown) and select Multiply in Transparency pallate. Duplicate the flower and lower the Opacity (Transparency).